Lynn Kirkland has lived in the village all of her life and was born at 77 Hill Drive. Married to Andy, who is also on the organising committee of Eaglesham Fair, they have one daughter Gillian. 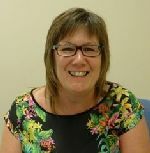 Lynn has worked in the Financial Services Industry since leaving school and currently is employed by an Asset Finance Company which is part of a large Australian bank. In her spare time Lynn is a keen walker who enjoys a challenge and she has recently completed a 12 day trip trekking the Great Wall of China for Charity. Lynn became involved with Eaglesham Fair when it was revived in 2005 when she offered to help out with some Secretarial duties. 10 years later she is still a part of the Eaglesham Fair Organising Committee and became a Trustee of the Charity in December 2014. Lynn was responsible for the funding application to 20/20 Renewables and the application to OSCR for Charity Status. Lynn believes Eaglesham is a fantastic place to live and the opportunity to be part of the Eaglesham Fair Charity, which will manage and distribute funds to projects within Eaglesham and Waterfoot, was an opportunity not to be missed. Lynn is sure everyone will have some great ideas as to what can be done to make the Village we live in even better and bring the Community together. Lynn encourages all relevant groups or individuals to put forward their applications for consideration and make full use of the funds given to us by AOE Windfarm Ltd.